Print KidCash at Home Today! 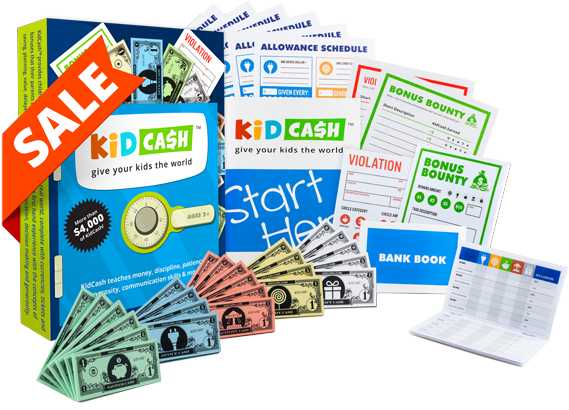 Your email will contain a link to download and print KidCash for Free. Share with your friends. By clicking submit, you will receive your download link and free tips. Unsubscribe at any time with one-click. Budget sugary treats and junk food easily with Candy Cash. Easily limit their time on digital devices, television and games with Device Cash. Teach kids how to budget, save and spend wisely with Savings Cash. Encourage healthy exercise habits and plan family fun with Activity Cash. Let children experience the joy of giving and sharing with Gift Cash. Make mentally tough goals easy to accomplish with Bonus Bounty. Gently talk about unwanted behavior at a calmer time with Violations. Keep their money safe and show them how saving works with Bank Books. KidCash is a flexible parenting system to help you define the rules, create structured touch points of praise & education, and a way to close the loop with extrinsic rewards. They'll think they're playing a game while learning valuable life skills. Use praise, incentives, clear structure and positive reinforcement to make it clear what you want. Use healthy intrinsic messaging when an event happens, and have them repeat it at allowance. Incentivize, reward and repeat to create productive behavior change over time. Get started today!